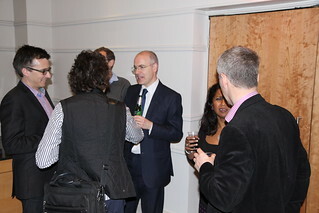 Gareth Wong’s (founder E/MBA & Gambond® ) Quarterly E/MBA Club London alumni events (www.CassAlumni.org) are notoriously hard to get an invite to, primarily because in order to attend you must be a fully graduated E/MBA alumnus of City / Cass Business School - it is that makes the club so very special. But with exclusivity taken to new heights some of the 1537 members would have had to entered competitions (indeed some did) to win a place at the very discreet and exclusive 28th E/MBA alumni event. 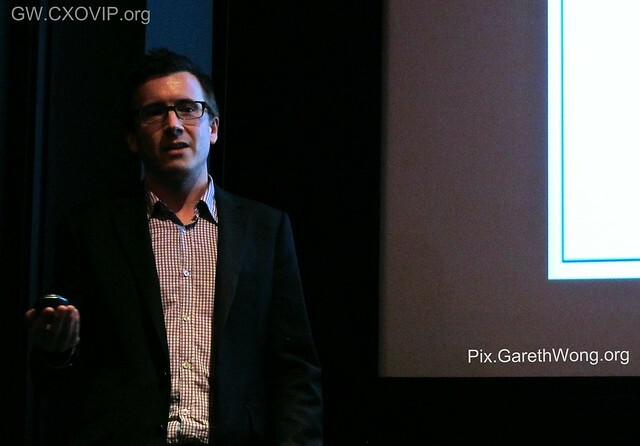 Rightly so, this was a special event by any standards – a pre-screening of “Life of Pi” in fabulous 3D hosted at the private VIP cinema of 20th Century Fox HQ in Soho Square, London! With seating limited to a cosy 30 attendees, senior business leaders, especially those in media, entertainment & finance were targeted with the modern equivalent of priority golden ticket invites in an all star cast ensemble of importance and reserved exuberance. With the likes of Mr Yuichi Alex Takayama CEO Tokio Marine Securities (EMBA00) flying in from Ireland, expectations were flying high. Indeed it is worth mentioning at this point that our gracious host Mr Cameron Saunders, Managing Director UK Theatrical at 20th Century Fox UK (EMBA00) went above and beyond the call of duty, not only did Cameron offer superb hospitality and deliver an excellent talk on the economics of the film industry and trends (which I apologise in advance for failing to do justice here in my article) but also kindly over-ran without hesitation on the Q & A despite having a poorly child at home. With the event kicking off at 18:45pm for light networking over refreshments and drinks, some elevator pitches were often dizzying by most people’s standards but without being grandiose. At this point, I quickly got into role by pulling out a big notepad (the only one from half a dozen that my daughter had not scribbled over, or was pink!) and an SLR camera with which I took great delight in recording the evening. I would like to thank Mr Gareth Wong for organising this great event and in bringing this special crowd together. On a personal note, Gareth’s conscientious inclusivity in extending the invitation to me with the opportunity to make a contribution as pseudo reporter and photographer is most gratefully appreciated, as well as Gareth’s on-going commitment to the successful E/MBA club. By 7pm 20 or so guests had arrived. The scene was set within the basement of the 20th Century Fox HQ. A brightly lit and non-ostentatious area contrasted invitingly by a darkly lit and comfy looking theatrical auditorium. There was a palatable sense of excitement and in particular, of anticipation about the coming 3D effects and animations - and for those who were slightly less informed about film, a mind-bending discovery of fantasy awaited. Once photography ground rules had been established, the guests moved effortlessly to the black fabric covered oversized seating. Amusingly, a few (no names starting with ‘G’ will be mentioned ;-) asked which the best seats were – no worries, you should see me when I walk into a 1000 seat cinema, I get struck down with the same cognitive dissonance. After Gareth briefly thanked the guests and event host Mr Cameron Saunders, Cameron opened with the interesting fact that his first day in role was Jan. 2009, the first day that President Obama was inaugurated. Well, it set the scene because President Obama was elected in 2008 and it was this year that Cameron selected as a baseline to the 2012 comparison of theatrical distribution trends split by box office, revenue, marketing and print. 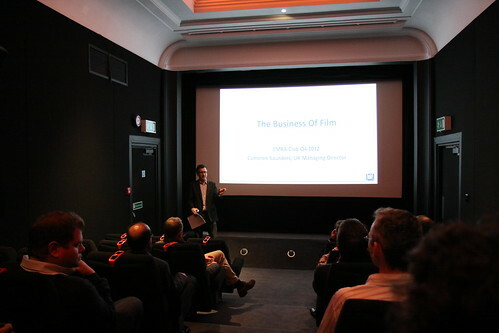 Cameron also spoke about the economics of the theatrical film industry (box office economics). Comparing a basket of films from 2008 to 2012, some had done better than expected and others not as expected. However, the aggregate variance of a basket of films observed was fairly tight but with individual films exhibiting big variance within a range of returns. For example “Taken” released in 2008 (with a sequel appearing in 2012, “Taken 2”) stood the test of time better than some other films released by Fox in that year (Juno, Jumper, Australia, The Happening, The Day The Earth Stood Still etc. ), showing that getting the formula right produces dividends married to longevity. The key here is achieving the right artistic ingredients and theatrical nuances (for want of a better comparison), ensuring the sun and moon alignment are most favourable to that mix at film launch! In terms of the economics, at 2008 prices, Fox’s cut of a £5 ticket would have been around £1.20 with growth to 2012 coming largely from box office ticket price inflation. But things have been changing structurally with a shift in the global pattern of film consumption driven by a number of factors including technology, piracy and new markets. For example, in Russia a film will be pirated next day after release, so upside from home entertainment is non-existent - significant because a chunk of revenue simply vanishes in that market space. With other emergent markets, e.g. China and Brazil, the Hollywood model (break even in the US, upside via international) has shifted with the US no longer the dominant consumer versus the international market – huge upside potential. Also, the new market mix has been marked by the changing nature of films to cater for a new predominance of tastes, for example Kung-Fu Panda to some extent developed to cater for the Asian market. Technology has impacted the industry too. Films can now be consumed via an array of technology outlets. This adds a layer of complexity (and leakage in the aftermarket) while at the film reel end, digital distribution using hard disks to cinema versus shipping huge drums of film has resulted in simplicity. 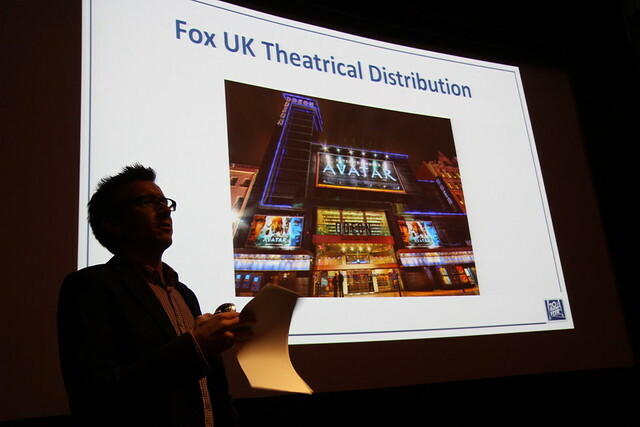 The cost of upgrading the cinema projection systems is being met by a consortium so not instant cost reduction benefit to 21st Century Fox, but once the transformation funding is complete, significant revenue savings will be realised across the board in film print and distribution. With global box office consumption changing shape, bets are potentially getting bigger. When Disney purchased the rights to the next “Star Wars” for $4.2 billion, it was seen as a bold move – and with global rights including theme parks, toys etc. there is a feeling that it will pay-off. Certainly there is enough in the mix for that to be the case. But with the focused goal of 20th Century Fox to achieve healthy theatrical profit, for them it is not a case of throwing a million dice and seeing which ones land 6. Numbers are much tighter and statistical modelling of success is particularly difficult with a small sample set - compounded by production and promotion budgets not being strong success indicators. The economy and the weather (amongst dozens of other factors) at release can have as significant impact. This gets us to the crux of the problem (and challenge) outlined by Cameron. How to better predict the box office performance of an individual film? What financial methodologies / modelling would achieve this on small sample sets and fuzzy data? Well, this is the gauntlet laid down by Cameron and should you accept the challenge, you could win two red carpet tickets to the Hitchcock premier on the 9th of December for the best answer (deadline 5th Dec.). So, for your chance to rub shoulders with the likes of Sir Anthony Hopkins and Dame Helen Mirren - do not delay submitting your solutions! Send answers to either Cameron directly or via Gareth Wong (who I’m sure will not pretend they are all his ideas, anyway he will be too busy to go). So, what happened to Life of Pi? Well following plenty of good questions from the audience we were rewarded with a visual and auditory odyssey of a very different kind. The combination of which created an enjoyable and memorable evening. The Life of Pi is a remarkable film by the Director Ang Lee. It is based on a fantasy adventure novel by Yann Martel published in 2001. The protagonist, Piscine Molitor "Pi" Patel, an Indian boy from Pondicherry, explores issues of spirituality and practicality from an early age. He survives 227 days after a shipwreck while stranded on a boat in the Pacific Ocean with a Bengal tiger named Richard Parker. The amazing visuals take the viewer on an epic and wonderful journey of adventure and discovery which is both somehow frustrating and rewarding in equal measure. A ground breaking film which may leave your mind wondering for some time after, perhaps to the point where you decide to go see it again – very clever if intended that way and maybe I will. 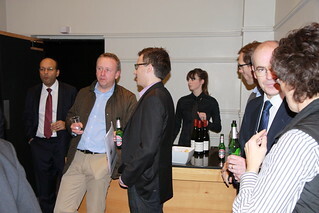 Thanks again to Cameron for hosting the 28th E/MBA club event at the 20th Century Fox HQ in London. On a commercial basis (which basically translates to the right film at the right price), 20th Century Fox can offer VIP private screenings for corporate hospitality at a number of exclusive venues (I’m told, much swankier than their own facilities). Should any of E/MBA have a requirement for entertainment of high net worth individuals or clients then do contact 20th Century Fox who partner with a corporate hospitality company to organise events such as this, or even secure Premiere tickets for a full red carpet treatment! surely we can do more! ?